10 • April 2018 • S I G N & D I G I T A L G R A P H I C S 3M Names New CEO, Creates New Role for Outgoing CEO 3M, St. Paul, Minnesota announces that Michael F. Roman is appointed as the firm's new chief executive officer, effective July 1, 2018. He succeeds Inge G. Thulin, who is appointed to a newly created position, execu- tive chairman of the board, also effective July. "After a thorough and thoughtful succes- sion planning process, Mike is the clear choice to lead 3M into the future as CEO," says Thulin. "He is an accomplished, results-oriented and high-integrity leader, with an excel- lent track record of growing sales, improving operational efficiency and increasing value across a wide range of global businesses." Roman, 58, has served as COO and executive VP since July 2017, with direct responsibility for 3M's five business groups, along with the company's international operations. "It is an honor to lead 3M into the future," Roman says. "Inge's leadership has taken 3M to new heights, and I look forward to building on our momentum and delivering value for customers and shareholders." In his new role as executive chairman of the board, Thulin will continue to chair 3M's Board of Directors while also working closely with Roman on longer-term strategic initiatives. 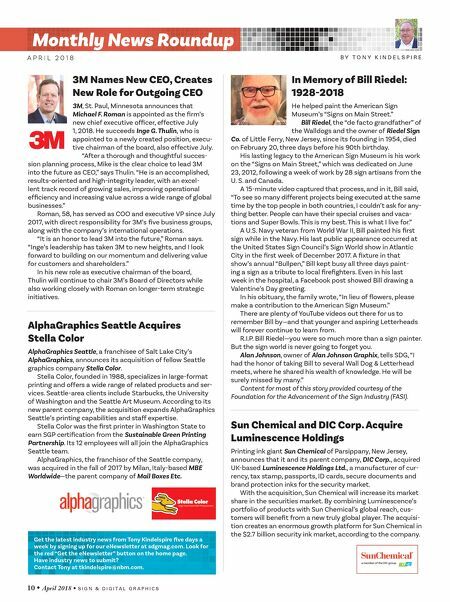 AlphaGraphics Seattle Acquires Stella Color AlphaGraphics Seattle, a franchisee of Salt Lake City's AlphaGraphics, announces its acquisition of fellow Seattle graphics company Stella Color. Stella Color, founded in 1988, specializes in large-format printing and offers a wide range of related products and ser- vices. Seattle-area clients include Starbucks, the University of Washington and the Seattle Art Museum. According to its new parent company, the acquisition expands AlphaGraphics Seattle's printing capabilities and staff expertise. Stella Color was the first printer in Washington State to earn SGP certification from the Sustainable Green Printing Partnership. Its 12 employees will all join the AlphaGraphics Seattle team. AlphaGraphics, the franchisor of the Seattle company, was acquired in the fall of 2017 by Milan, Italy-based MBE Worldwide—the parent company of Mail Boxes Etc. In Memory of Bill Riedel: 1928-2018 He helped paint the American Sign Museum's "Signs on Main Street." Bill Riedel, the "de facto grandfather" of the Walldogs and the owner of Riedel Sign Co. of Little Ferry, New Jersey, since its founding in 1954, died on February 20, three days before his 90th birthday. His lasting legacy to the American Sign Museum is his work on the "Signs on Main Street," which was dedicated on June 23, 2012, following a week of work by 28 sign artisans from the U. S. and Canada. A 15-minute video captured that process, and in it, Bill said, "To see so many different projects being executed at the same time by the top people in both countries, I couldn't ask for any- thing better. People can have their special cruises and vaca- tions and Super Bowls. This is my best. This is what I live for." A U.S. Navy veteran from World War II, Bill painted his first sign while in the Navy. His last public appearance occurred at the United States Sign Council's Sign World show in Atlantic City in the first week of December 2017. A fixture in that show's annual "Bullpen," Bill kept busy all three days paint- ing a sign as a tribute to local firefighters. Even in his last week in the hospital, a Facebook post showed Bill drawing a Valentine's Day greeting. In his obituary, the family wrote, "In lieu of flowers, please make a contribution to the American Sign Museum." There are plenty of YouTube videos out there for us to remember Bill by—and that younger and aspiring Letterheads will forever continue to learn from. R.I.P. Bill Riedel—you were so much more than a sign painter. But the sign world is never going to forget you. Alan Johnson, owner of Alan Johnson Graphix, tells SDG, "I had the honor of taking Bill to several Wall Dog & Letterhead meets, where he shared his wealth of knowledge. He will be surely missed by many." 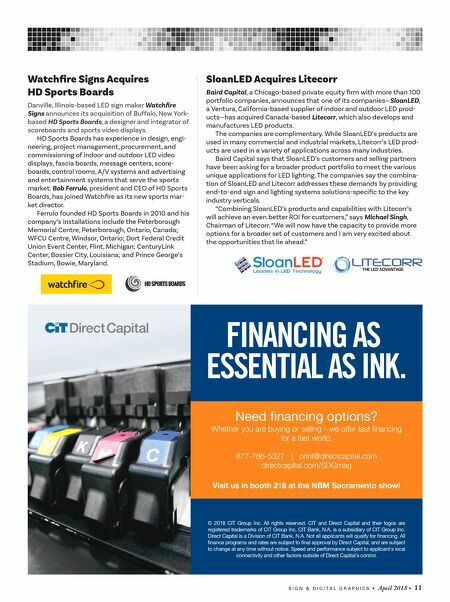 Content for most of this story provided courtesy of the Foundation for the Advancement of the Sign Industry (FASI). Sun Chemical and DIC Corp. Acquire Luminescence Holdings Printing ink giant Sun Chemical of Parsippany, New Jersey, announces that it and its parent company, DIC Corp., acquired UK-based Luminescence Holdings Ltd., a manufacturer of cur- rency, tax stamp, passports, ID cards, secure documents and brand protection inks for the security market. With the acquisition, Sun Chemical will increase its market share in the securities market. By combining Luminescence's portfolio of products with Sun Chemical's global reach, cus- tomers will benefit from a new truly global player. The acquisi- tion creates an enormous growth platform for Sun Chemical in the $2.7 billion security ink market, according to the company. Monthly News Roundup B Y T O N Y K I N D E L S P I R E A P R I L 2 0 1 8 Get the latest industry news from Tony Kindelspire five days a week by signing up for our eNewsletter at sdgmag.com. Look for the red "Get the eNewsletter" button on the home page. Have industry news to submit? Contact Tony at tkindelspire@nbm.com.